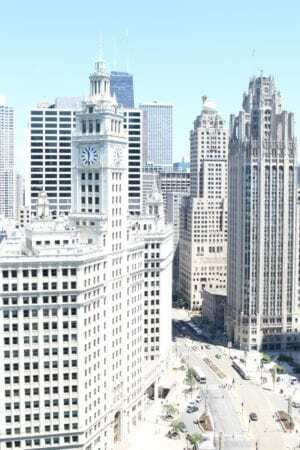 Every step of our renovation process so far has been SO exciting. Even the smallest changes have had me giddy because let’s be honest — progress is progress! But today’s transformation may be one of my all-time favorites. 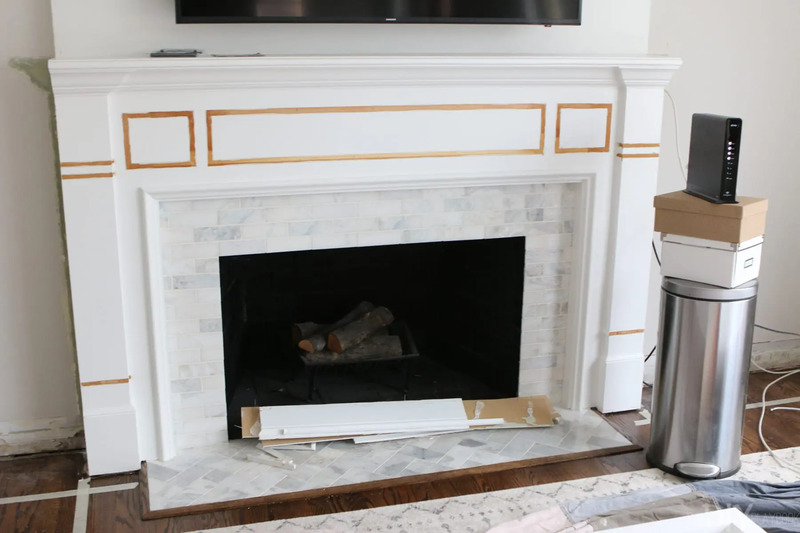 The white built-ins around the fireplace have been installed and you guys, I can’t even. I’m literally ob-sessed and I can’t wait to finally catch you up on ALL the details. So where shall we start?! 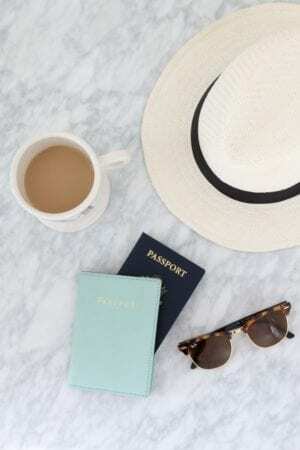 I guess the beginning is probably the best place. Remember what our living room looked like when we first moved in? Can you see why this update is my favorite?! I swear I find myself just sitting in here staring at this gorgeous wall far too often. It’s everything I had hoped for and way, way more. But how exactly did we get here? 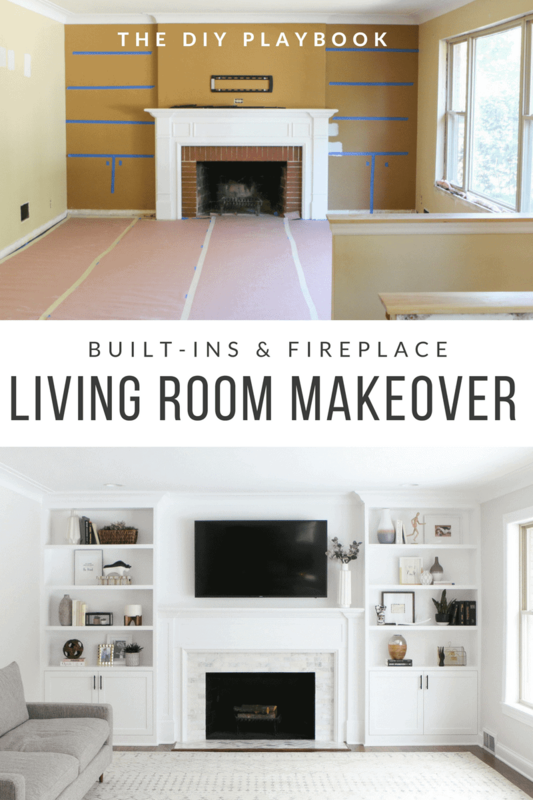 Today I’m taking you step-by-step through the process of how these white built-ins around the fireplace came to be. 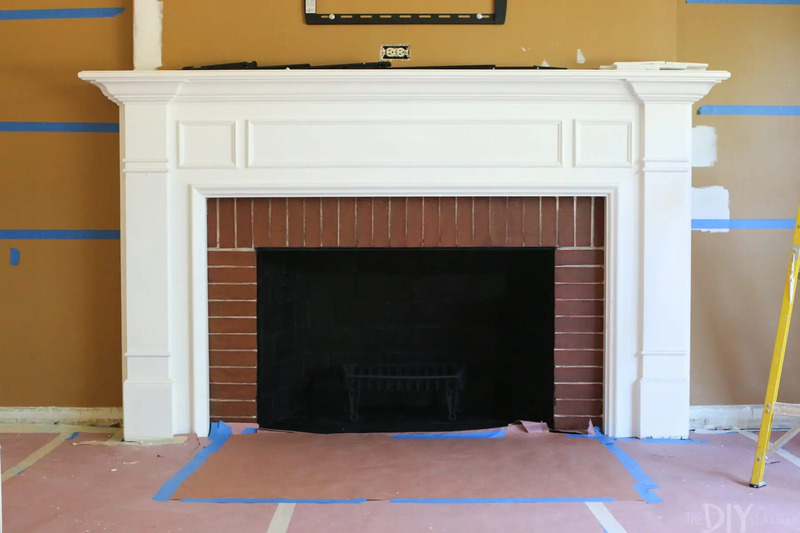 The very first thing we did on the fireplace was swap out the old red bricks for marble tile. 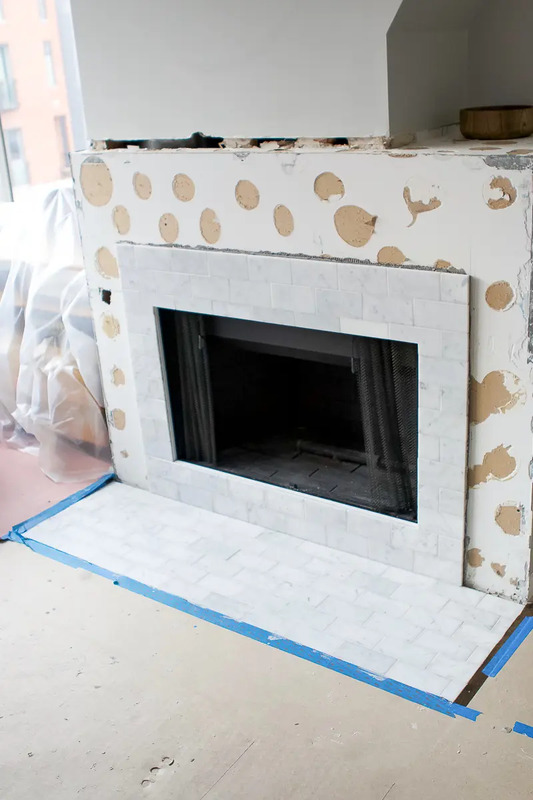 I have a whole post coming tomorrow on the details of this process (including the tile we used), but getting the red brick removed and replaced was our first priority. That update made such a big impact right away. We then went on to paint the walls, finish the trim throughout the house, and eventually re-stain the floor. But other than those updates, this space sat dormant for the next few months as our contractor worked his magic. We mounted the TV, bought a rug, got a couch delivery and then just waited. Every day I would look at that trash can tower of cords and wonder when the shelves would be done. That was until I finally got a call in mid-January that after 4 months of building (and crazy life situations that delayed the contractor), the shelves were ready! 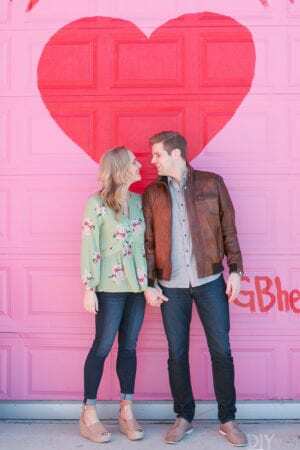 He brought them over and I was already in love — even without seeing them on the wall yet! It was crazy to me that some tape on a wall months ago could eventually translate to these beautiful pieces. How do these amazing carpenters do it?! 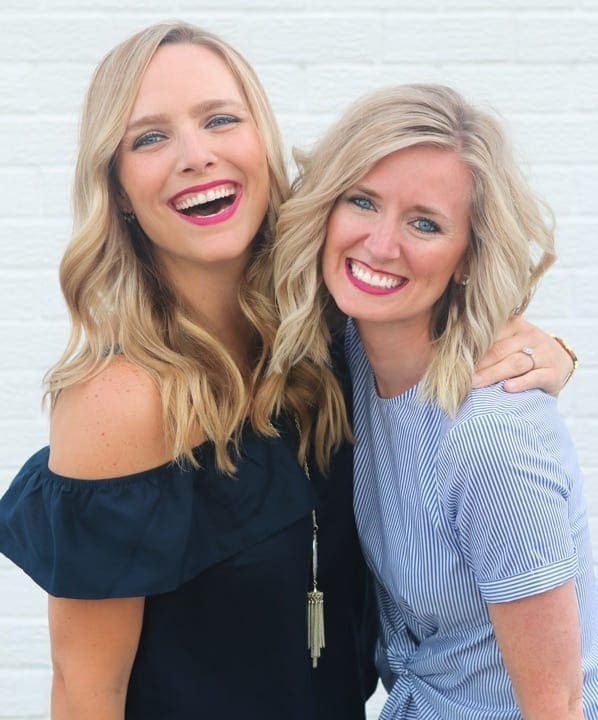 Now that it was finally time for installation, there are a few things that happened throughout the installation process that I want to chat about. 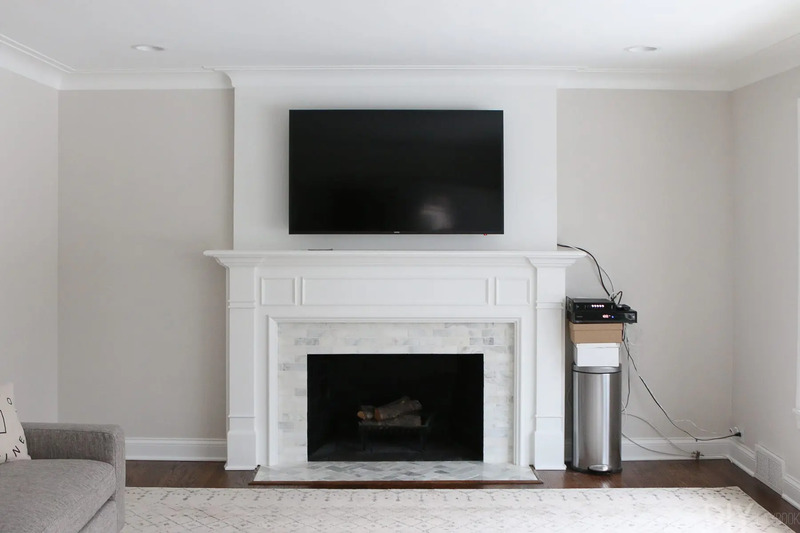 For starters, let me explain why we chose to alter the facing of the fireplace. 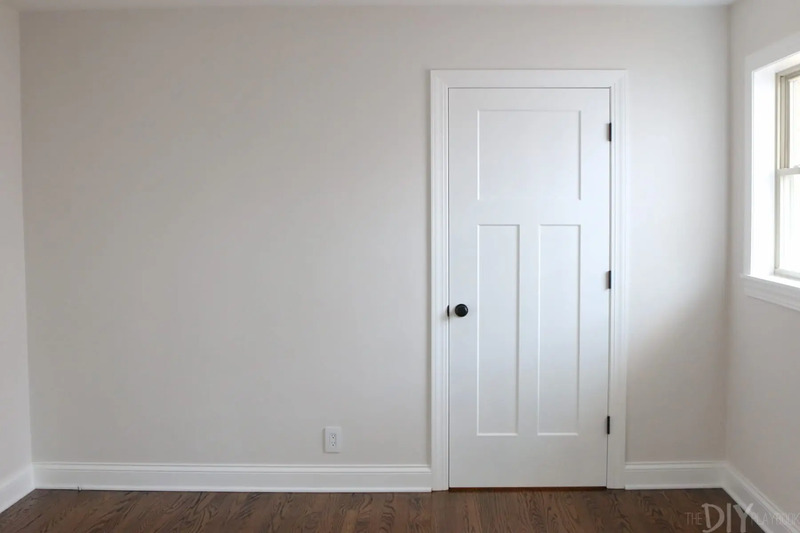 You guys remember when we updated all of the doors in our house to these white, Craftsman-style doors? Well if you notice, the wood detailing on these doors is very plain and the angles are very straight. Simple, clean lines. The wood on the “original” fireplace wasn’t super detailed, but it was definitely more ornate and felt fancier than the Craftsman-style doors we now have. 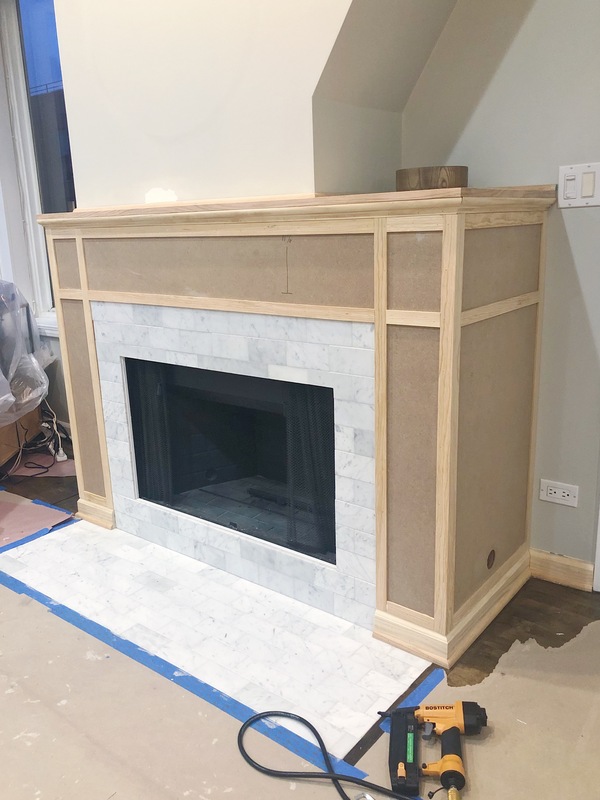 So I decided that while we were working on the built-ins, I would have the carpenter also replace some of the wood trim on the fireplace to reflect that same simplicity from our doors (and the built-in cabinet doors). It was no problem at all. 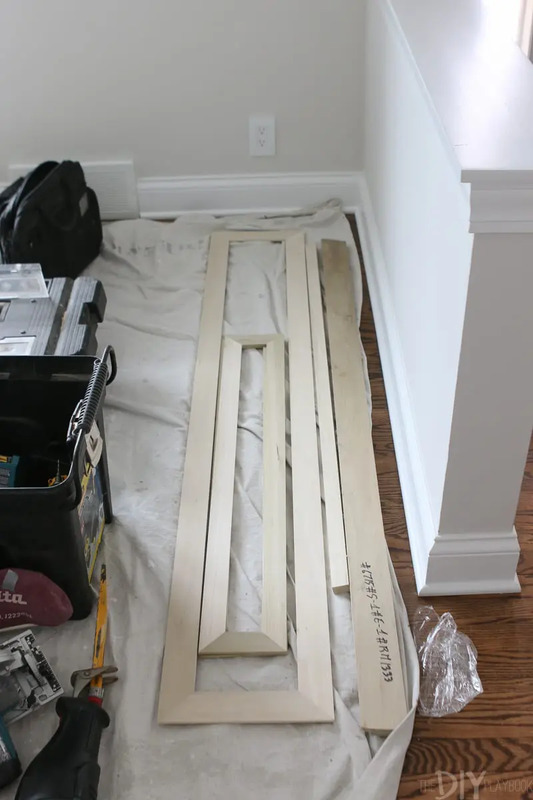 He popped off the old trim detail, sanded it down and brought over some more plain wood pieces to update the look. These are the pieces he brought over to replace the old stuff. I loved the simple, clean lines that tie all of these wood elements together. He also had to cut off the sides of the mantle so that the shelves would fit into the wall cleanly. 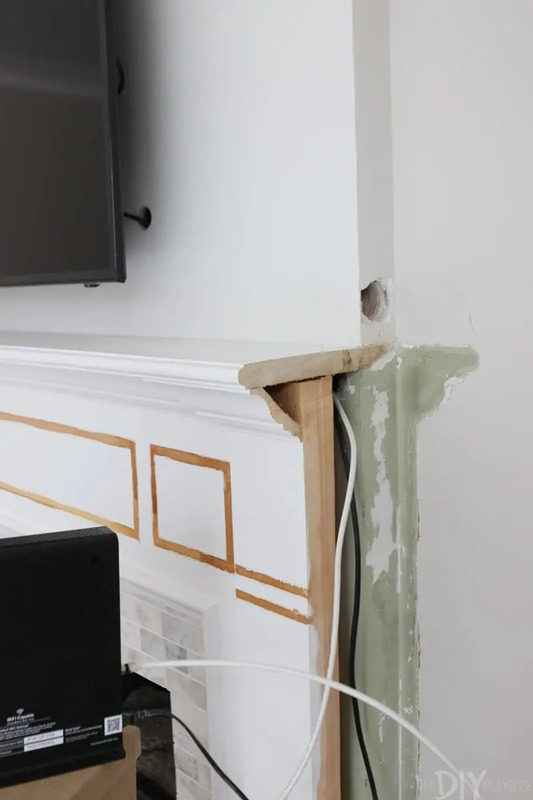 This was actually a great perk because it allowed us to pull the cable and TV wires through the mantle and hide them in the cabinets of the built-ins (more on that in a second). 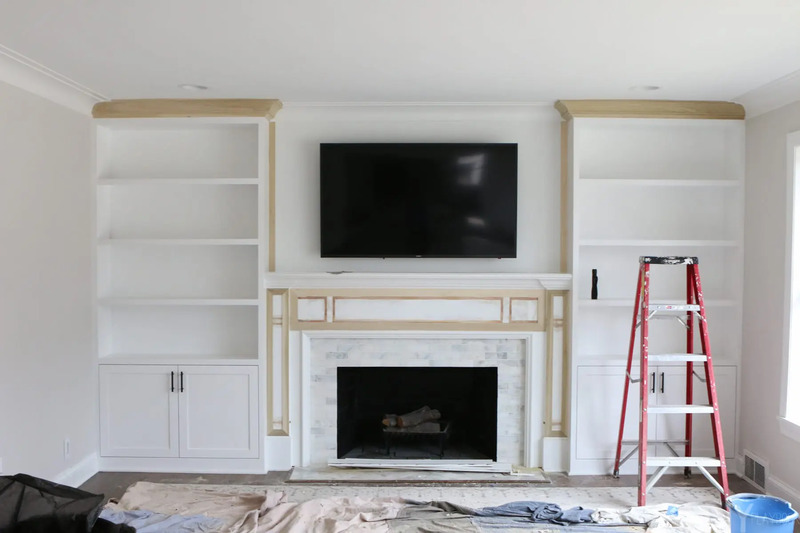 After the fireplace details were in order, the carpenter secured the two shelving units on both sides of the fireplace. 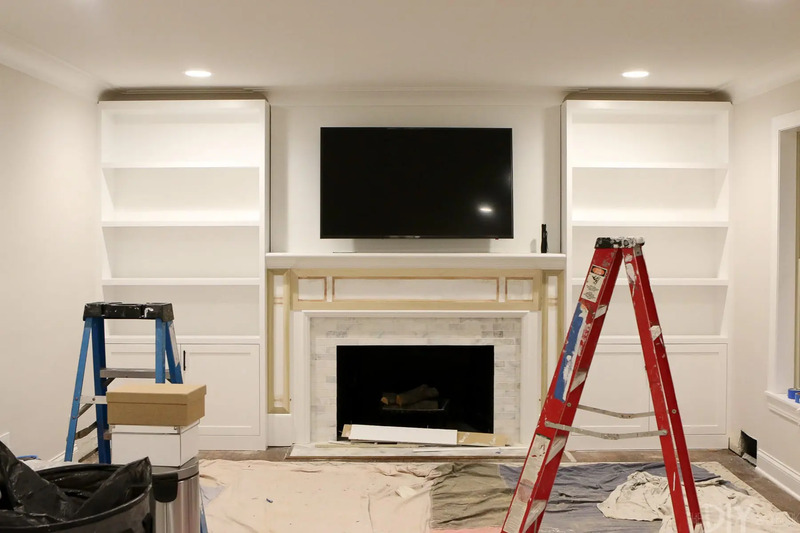 They looked pretty amazing… even without the paint done or crown molding installed. But it was those last two components that brought this look to the next level. The crown molding was actually something I was really nervous about. 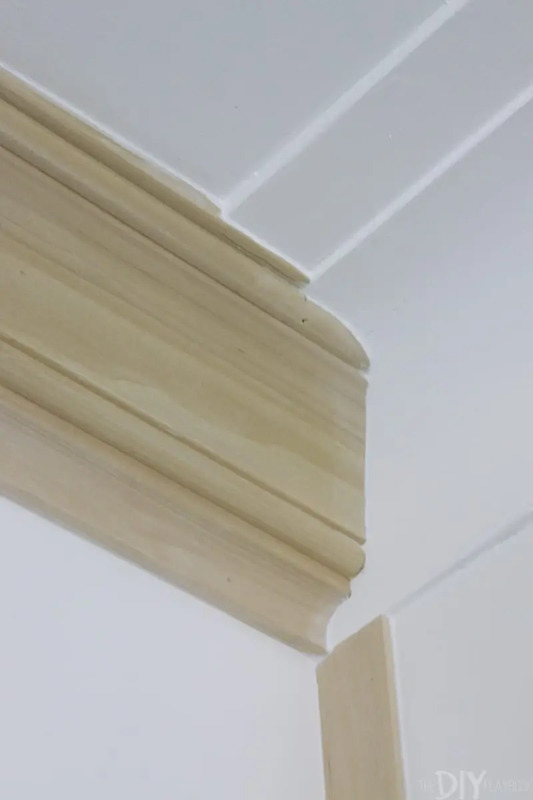 This room’s crown molding is PLASTER. Old house problems. 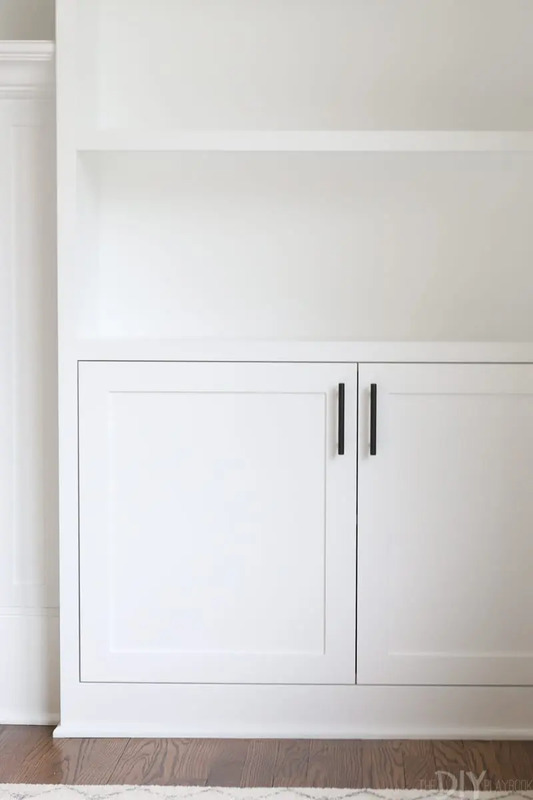 Plaster crown molding means that it couldn’t be replicated on these built-ins, which had me feeling super hesitant about what to expect. But SOMEHOW our amazing carpenter created pieces of wood that blended into the plaster crown molding almost perfectly. I mean, pretty amazing right?! Once the crown molding was painted, you would probably never notice that it’s not the same crown molding (heck, not even the same material!). 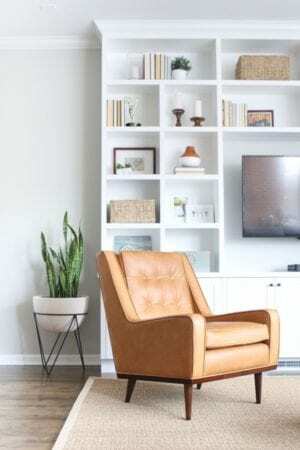 These are the details that make this custom built-in so worth the price tag. At $3,500 this was definitely a large investment for us, but both Matt and I agreed that it is well worth it in resale value in the long-run. 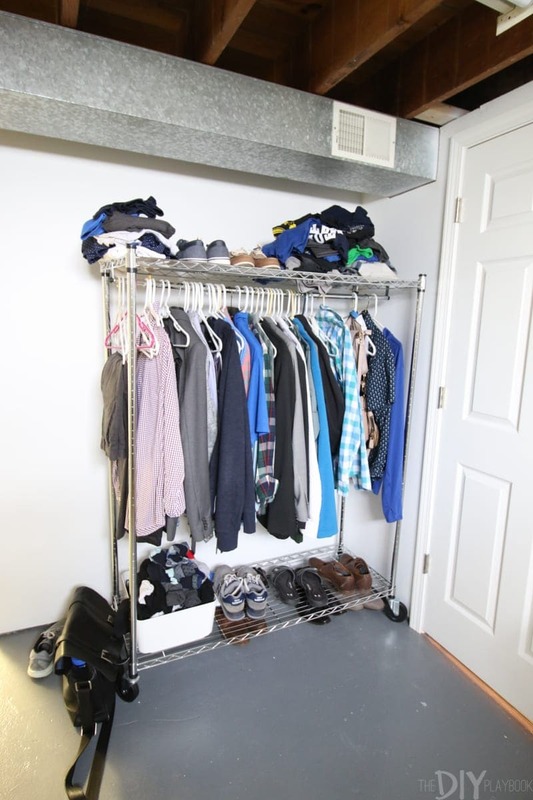 Plus, buying two large units to plank this space would have cost us some money (definitely not $3,500) but that does make us a feel less guilty about the large price tag. 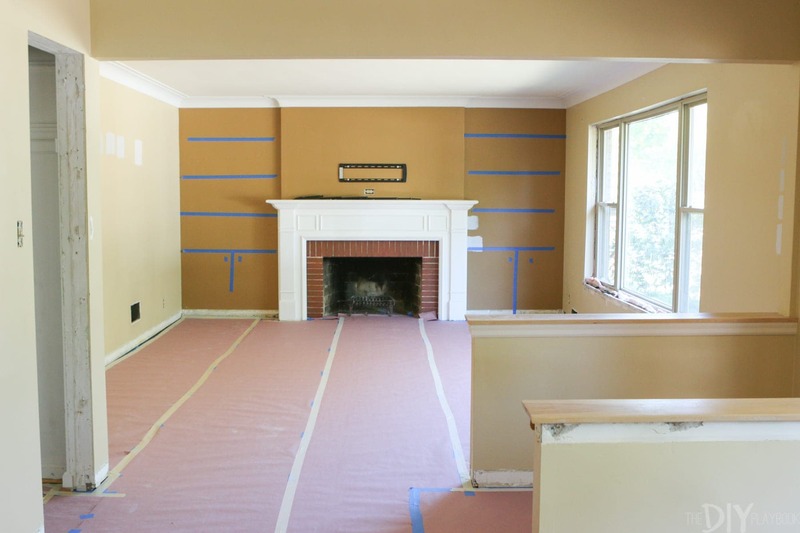 Last, but very not least, it was time to paint the fireplace and crown molding to bring this cohesive look together. My amazing dad came over (again!) and prepped, primed and painted the last few pieces. 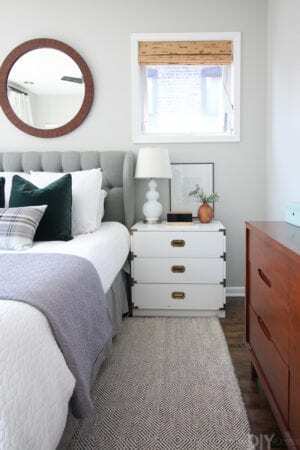 He used pre-mixed Benjamin Moore White to match the exising wood with the built-ins. My jaw literally dropped when the painting was all done. 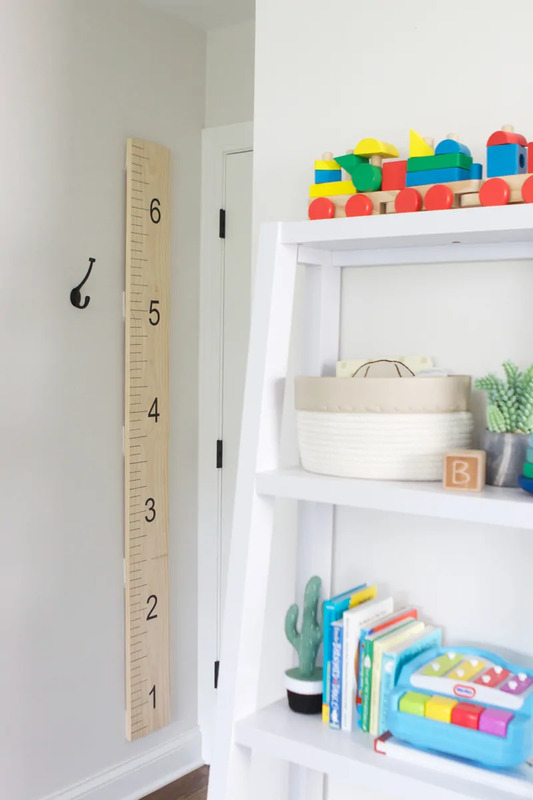 I couldn’t even believe how much this built-in changed the whole feel of the space. 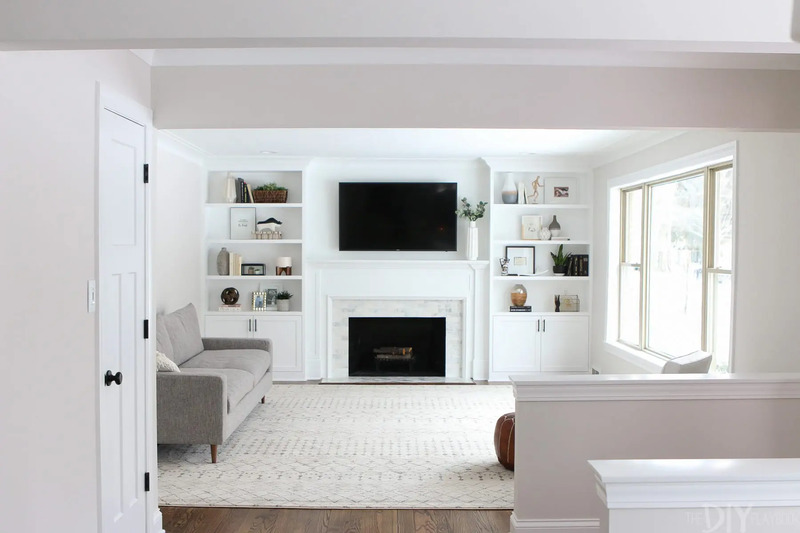 The depth of the walls on either side of the fireplace isn’t very deep, so the shelves and cabinets of the built-ins are only 12 inches deep (and 14″ high). This depth doesn’t give us a lot of functional storage but honestly, we have plenty of storage in our home so I’m not super concerned. 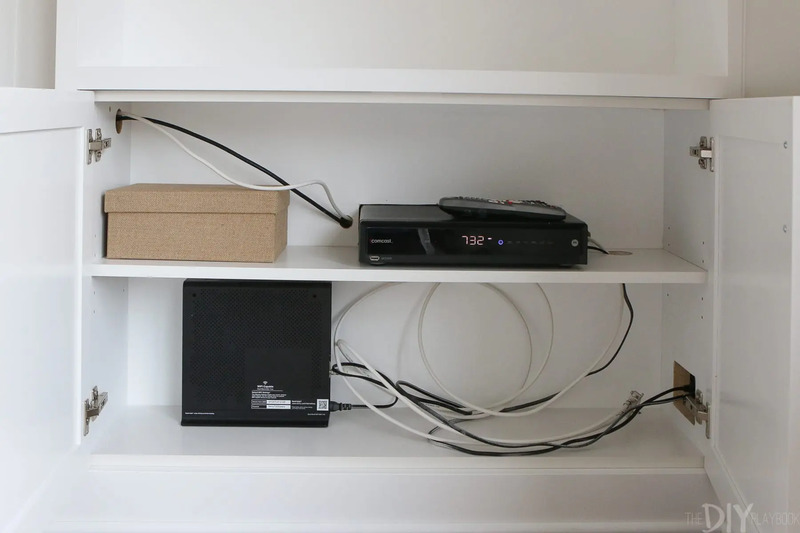 The good news is that the shelves are deep enough to hold and hide all of the cable, internet, and TV cords. Hidden behind the cabinets we have a bit of a hot mess of wires that I hope to address in the near future. But for now, the fact that all of our boxes and cords are HIDDEN is a big win for us. We also have to work on the fact that as of now, we have to open the one cabinet to change the channel on the TV. Not the worst thing ever, but a dilemma I’d like to solve. I found out that it should be an easy fix after some investigative work. All we have to do is change the cable box to radio frequency and then the signal from the remote should travel right through the cabinets! But it seems as though our cable box is a bit too outdated for this adjustment, so I’m working with the cable company on getting that changed soon. I’ll keep you guys updated when I figure it all out. But until then, I still can’t believe this project is done. 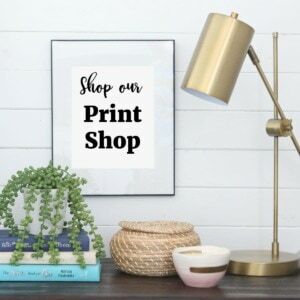 It makes the space so. much. better! Now all we have left in this room is add some art, a few more pieces of furniture, window treatments and then some final details to pull it all together. 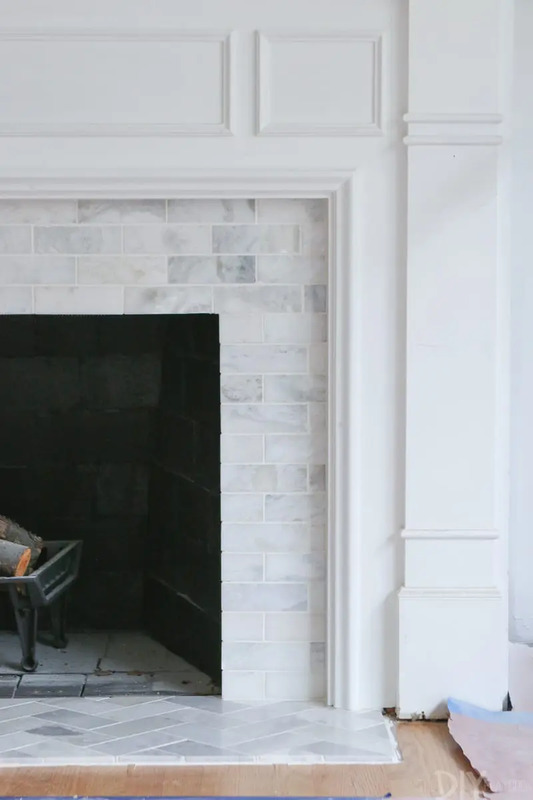 Tomorrow I’ll check in with more details about the fireplace, I’m also planning a shelf styling post since we’ve gotten so many requests about this topic. But before I go, I have to show you this before and after ONE MORE TIME because it’s just too good not to. 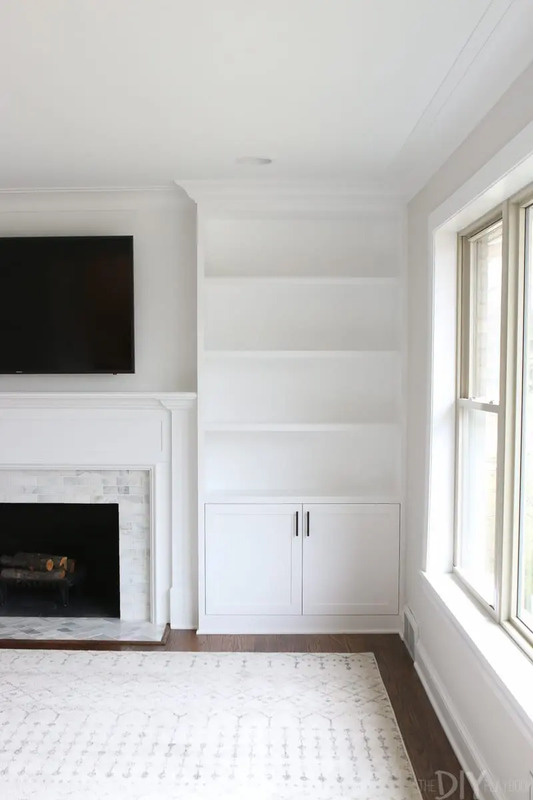 Thanks so much for your patience in seeing these white built-ins around the fireplace finally come to life. I hope the transformation was worth the wait, I know it was for me! P.S. 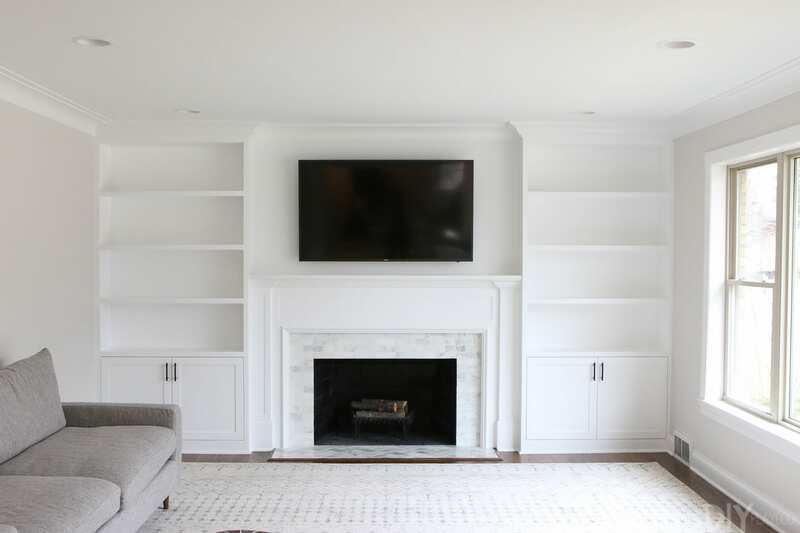 We’ve gotten a lot of inquiries from local readers who want the contact information of the amazing carpenter behind these built-ins. Unfortunately, he is a family friend who agreed to take on this project but isn’t taking on any others like it. I really wish he was because he’s seriously amazing! I promise if we ever come across another built-in expert, we will let you guys know because finding a professional for a project like this is HARD. Casey’s mom is on the hunt for one too and we can tell you first hand that we feel your pain! The struggle is real.